With an average profit of $72,450, home flippers saw larger returns from their fix-and-sell hustle in the first quarter than they have in the past four years that RealtyTrac has been publishing its U.S. Home Flipping Report. That profit represents a 17.4 percent jump in average profit per flip over the first quarter of 2014. 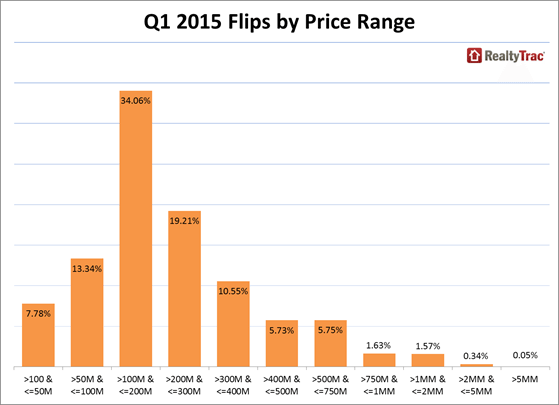 Though mean profits were up, it took flippers longer to sell their flips — an average of 176 days — than any time in the report’s history, according to the first-quarter 2015 edition. Homes considered flipped by RealtyTrac in this report were defined as houses sold that had been purchased within the previous 12 months. As for return on investment, flippers saw an average of a 35.1 percent return on their rehabs in the quarter, down from the previous quarter’s 35.3 percent and up for the year, from 35 percent. “The strong returns for home flippers in the first quarter demonstrates that there is still a need in this recovering real estate market for move-in-ready homes rehabbed to more modern tastes, particularly given the dearth of new homes being built,” said Daren Blomquist, vice president at RealtyTrac, in a statement. The largest share of homes flipped, 34 percent, were on the lower end, selling for between $100,000 and $200,000. Homes that sold for between $200,000 and $300,000 accounted for 19 percent of the first quarter’s flips. Among markets with at least 50 completed single-family home flips in the first quarter, those with the highest average gross return on investment (ROI) were Baltimore (94.1 percent), Deltona-Daytona Beach-Ormond Beach, Florida (74.7 percent), Ocala, Florida (73.9 percent), Lakeland, Florida (62.5 percent) and Detroit (58.3 percent). Source: RealtyTrac *Among markets with at least 50 completed single family home flips in the first quarter. Among markets with at least 50 completed single-family home flips in the first quarter, those where flips accounted for the highest percentage of all home sales in the first quarter were Memphis (10.6 percent), Ocala, Florida (8 percent), Miami (7.9 percent), Tampa (7.4 percent) and Sarasota, Florida (7.2 percent).